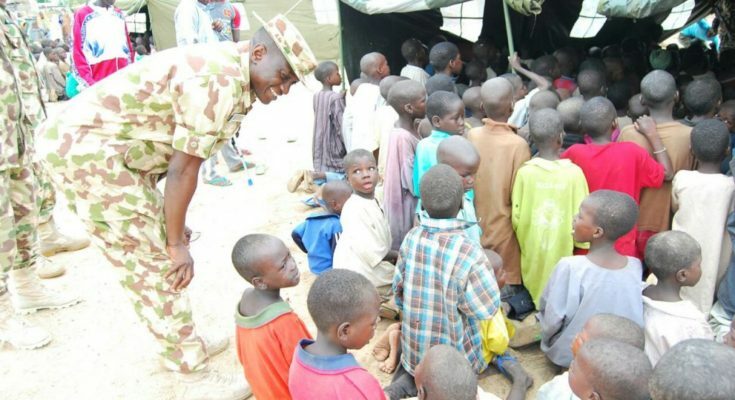 To further assist the internally displaced persons and enhance civil-military relations, troops of 21 Brigade, 7 Division Nigerian Army, have established a temporary school for the children at the Internally Displaced Persons (IDP) camp located in Bama town, Bama Local Government Area of Borno State using military tents. 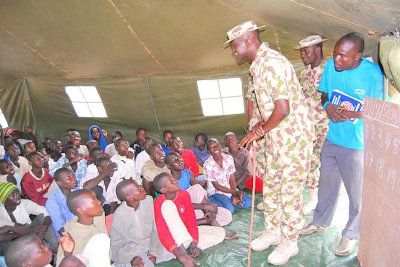 The school comprised 6 military tents in which soldiers not on essential duty served as teachers. In addition, some of the IDPs who were teachers before the their displacement, also teach in the school. Presently, the school has a population of over 3,000 children. The Brigade has also establish a section of adult education for women. 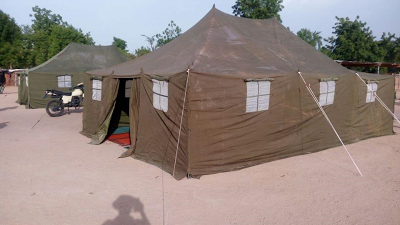 Impressed with the laudable initiative, the United Nations Children Fund (UNICEF) also assisted the Brigade with 2 additional tents and school bags for the pupils, while Borno State Urban Education deployed a Principal to assist in running of the school. 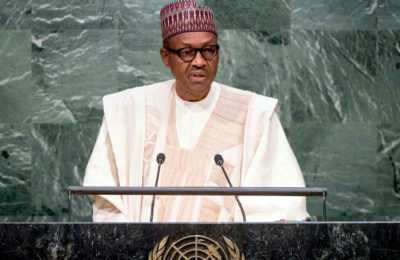 The United Nations Assistant Secretary-General and the Regional Humanitarian Coordinator for the Sahel, Mr Toby Lanzer, and Borno State Government celebrated the recently held World Humanitarian Day with the IDPs in the school and commended the efforts of the Nigerian Army for establishing the school. 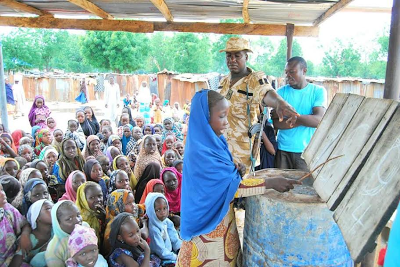 Similarly, an American Non-Government Organization (NGO), Empower54, equally impressed with the fact that “despite the heavy responsibility of fighting off the terrorists daily, the soldiers are making time to teach the children”, appreciates the soldiers of 21 Brigade for their selfless effort by establishing the school in a blog and hashtag.